Boots are available to fit UK adult foot size 3 to 12 (subject to stock). Select your required size above. 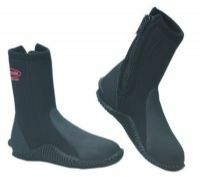 The best selling Typhoon Surfmaster II neoprene boot. Made from 6 mm neoprene combined with a heavy duty vulcanized sole and a new curved zip, fin block and top reinforcing. The perfect dive boot which is also a hit with everyone who wants a maximum warmth and strength from their boots.